It is the stuff of Star Trek starship legend. A tale whispered in the corners of convention centres and on the deep dark hidden threads of chat rooms long forgotten...the Yeager Class. 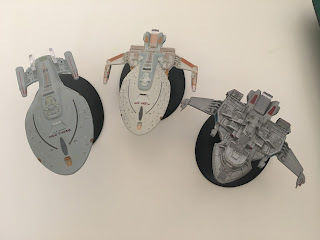 For almost as long as the collection has been in existence fans have been highly interested in the kitbashes - the background fillers, the ships remastered for budget and time constraints etc etc but one such Starfleet ship has always been a pit of controversy with its apparent half-arsed slapdash construction for use in Deep Space Nine. Indeed, Ben Robinson teased us that it was coming a matter of months ago with a screenshot from his computer of two folders one entitled ‘Voyager’ and one ‘Maquis Raider’ which cemented the belief that it was on the way. 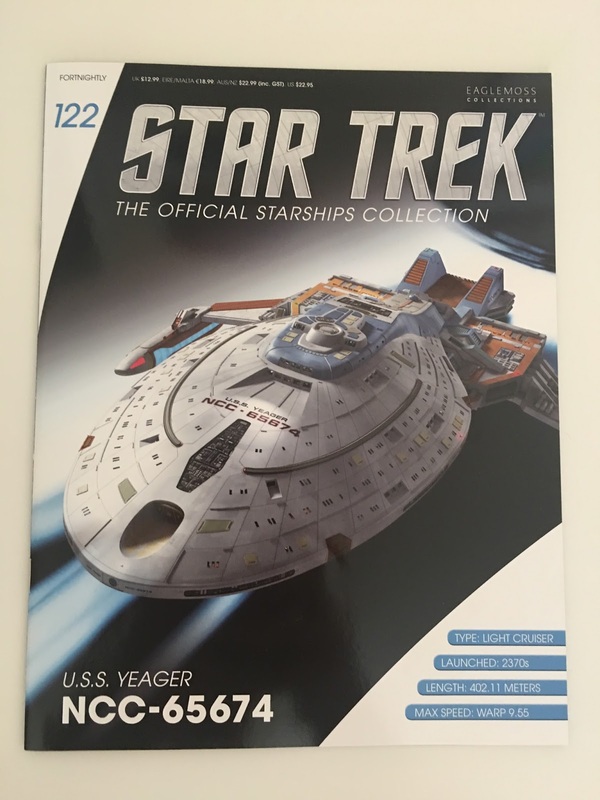 I didn’t quite know what to expect from the Yeager Class to be honest however the resultant model has - believe it or not - a lot of good points which make it worthy of the collection and as a standalone issue too. First up there’s the spoon-shaped Voyager primary hull bunged on top of the Maquis Raider hull. Line this up with the issue six replica of the Intrepid Class and you can see the difference in quality in a split second which seems a bit odd since it's smaller than the original. 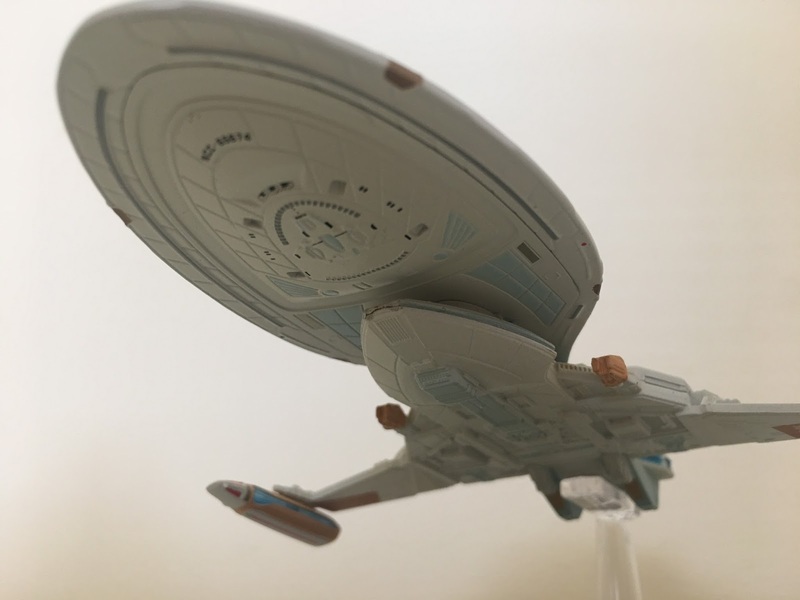 The metal saucer is a much lighter shade to Voyager, almost a creamy white rather than the duck egg blue. The markings are very distinctive too with rows of windows painted up on the exterior. Both the forward sensor platform and exposed mechanics just above it are much more detailed and seem to have a much thinner paint finish which shows up all the elements more effectively. The hull panel lines are just as distinct splaying out from the central bridge cluster to the edges of the saucer. The bridge module itself is the only part of the ship that retains the duck egg blue from Voyager and only then at select points. The recessed windows around the saucer have much more depth here than Voyager. Perhaps the only finer detail missing is the red curves from around the ends of the raised phaser strips arcing around the bridge module. Also some of the block detailing around the bridge contrasts to the rest of the saucer detail and has much less definition. Some of the panelling towards the neck area as it drops down to the Maquis Raider section also seems more washed out than on the majority of the primary hull. The underside of the Intrepid Class saucer also has the lighter paint scheme that allows the hull detail to shine through. 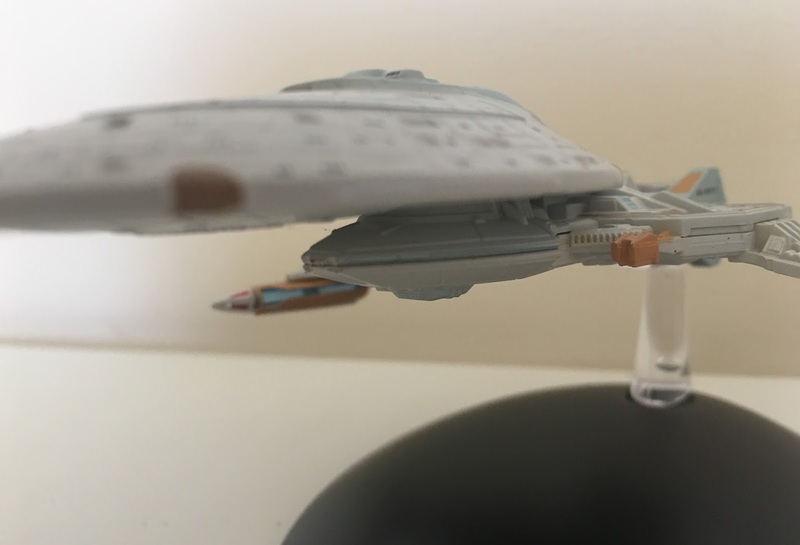 The RCS thrusters at the edge as well as the phaser strips are tightly painted on and there's a ship registry to match the one topside but without the name. This underside is a very close and flush fit plastic section into the metal upper half and feeds back into the cut down Raider. The Maquis Raider section doesn't work as well however. The rear also carries the ship registry on the port and starboard sides as well as on either of the fins. The Yeager is one of the brightest starships in the fleet with that multi-coloured paint scheme especially with the tanned shoulder sections leading out to the warp nacelles. The brushed metal of the Maquis Raider gave much more depth to the craft but here a lot of that surface intricacy is lost under the oranges and browns. You can also spot where the engine blocks on either side of the hull have been removed. 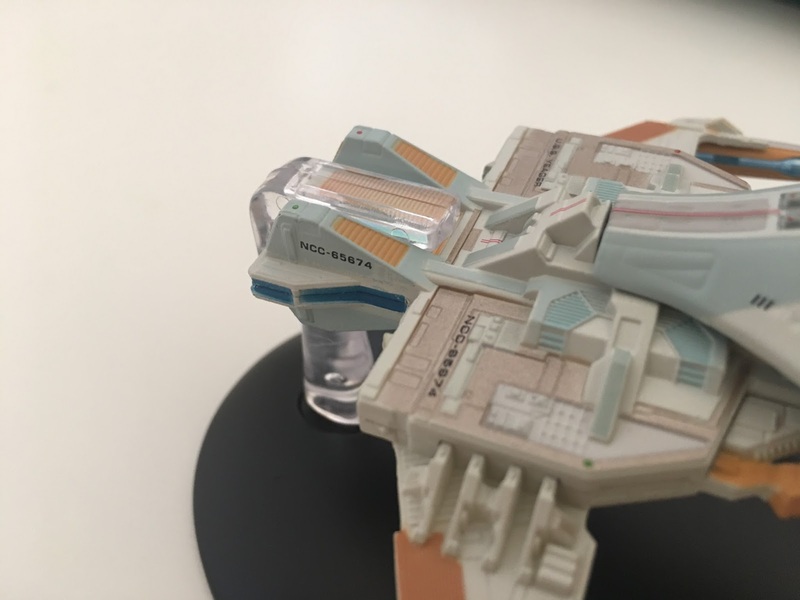 The stand position is identical to the Raider gripping between the upright fins and providing that "flying" effect which leaves the rest of the hull free and easy to view. The underside of the Raider is fairly bland with the new overcoat taking out a lot of the detail we saw previously. Eaglemoss does seem to have an issue with some of their paints in that they thicken up and do sap all the detail out of the ships meaning you can't appreciate the work that went into the original mould. The requisitioned Intrepid Class warp nacelles hang angled towards the front of the kitbash and mine actually arrived with one rattling around in the box. 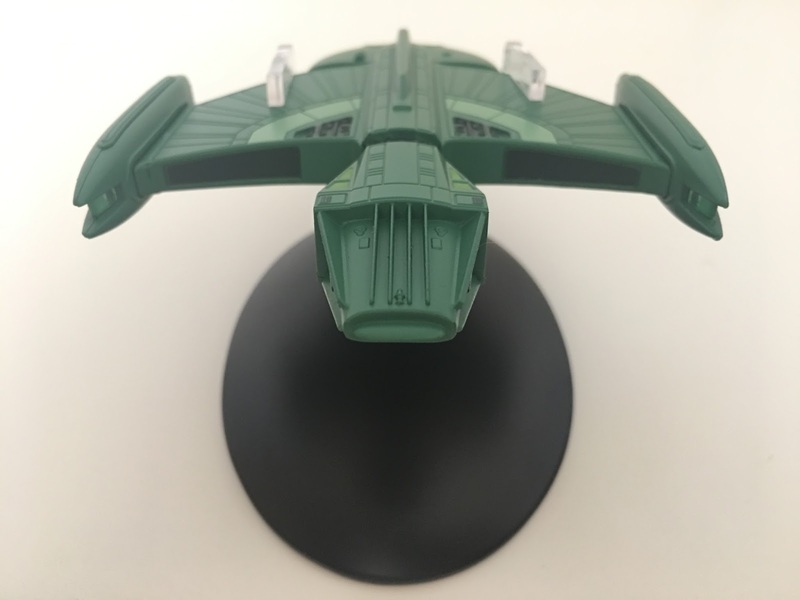 They're just pegged onto the wings of the Raider hull but Eaglemoss have managed to include translucent warp field grilles even though they are fairly small. The bussard collectors however are just painted on and the triangular segments are well finished. 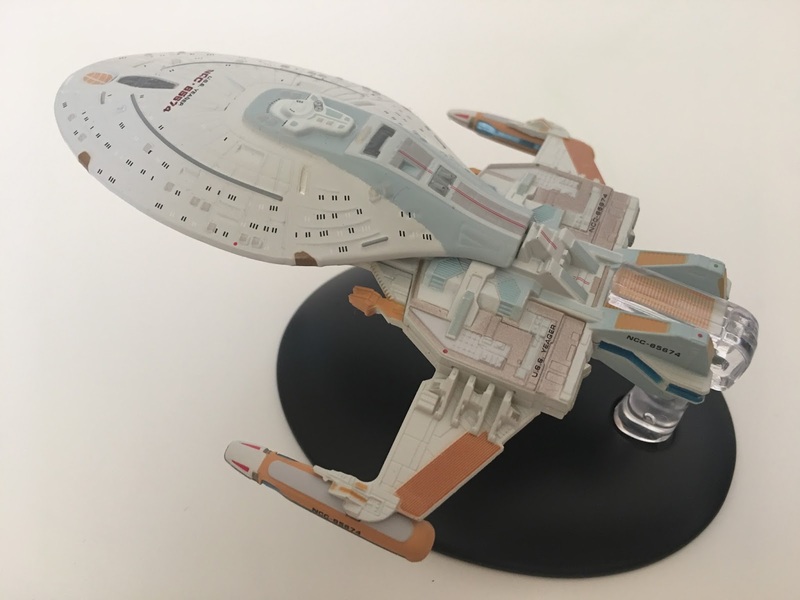 That said, the whole paint job on the Yeager is free of bleeds or errors and congratulations are certainly in order since this has one of the more complex finishes of the collection, Usually there are only one or two colours but this has a lot more to it. The joint lines right across this model are very impressive with a lot of different sections all nicely slotted together. I might go as far as saying that this has one of the highest number of parts in the collection and definitely the largest number of variations from the norm. To the magazine which covers the reasons behind the creation of the Yeager after the Dominion obliterated a good portion of Starflleet both this ship and the Curry Class became part of the "Frankenfleet"; assembled to replenish the ranks quickly from whatever parts were available. Great CGI pics in here that, when you compare them to the filming model that turned up on several occasions in Deep Space Nine, is of a sensationally higher quality than the original. Then we tackle the making of the model itself at the hands of the late Gary Hutzel. A combination of the USS Voyager and the Maquis Raider Revel model kits, the Yeager might have been an odd construction but its existence is burned into the memory of every fan; it's literally had that kind of impact. Finishing off this edition we have an interview with writer Hans Beimler. Although Beimler worked on The Next Generation I'm happy to say we get a piece dedicated to his work on Deep Space Nine and just how different and challenging the environment was from the world of Picard and the Enterprise-D.
Now issue 123 pains me greatly. 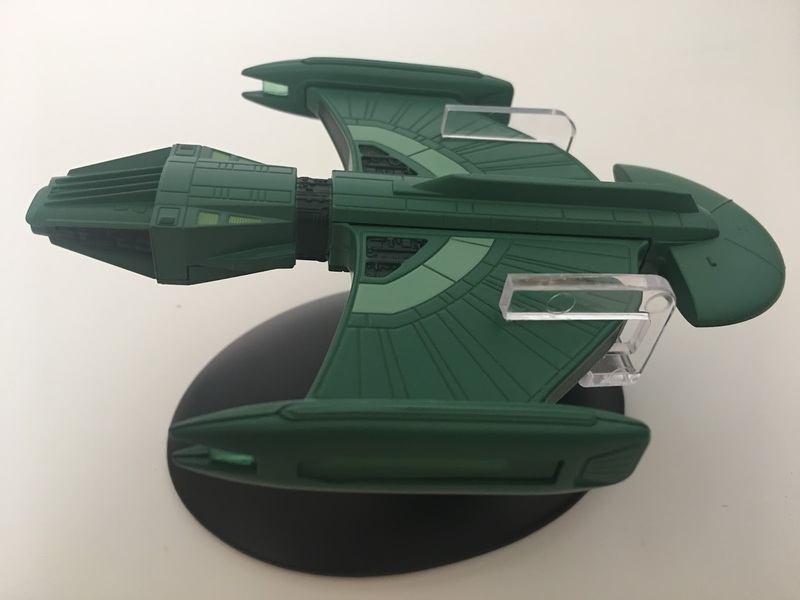 The Romulan Scout Ship was a great edition, nicely detailed and has a prime spot on my Romulan shelf (what else would you expect???). 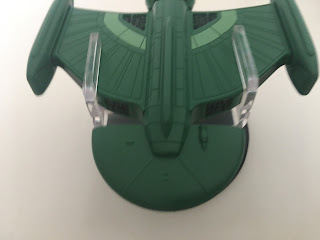 The problem is here that 1) is there a right way up for the Romulan Science Vessel and 2) was it actually that great a refit of the original model? The answers to those questions are; not a clue and no. Y'see the biggest differences between the Scout and Science vessels are the removal of the original and very obviously Romulan nosecone and the addition of a semi-circular tail piece. The result is in no way Eaglemoss' fault and we were due it at some point but what this issue makes you come to terms with is just how much the production team got away with when it came to repurposing ships. We've seen it with the Bajoran Freighter/Smugglers' Ship, the Jenolan/Spacedock Shuttle and without doubt the Reliant/Saratoga/Bozeman triumvirate. Indeed, here we have another two issues in a row which are - if you think about it - just reworkings of ships we have already received through the collection. Seen once and only once in The Next Phase from the back end of The Next Generation's fifth season, the Science Vessel is, for the first time a ship that is the same both ways up. Now not only could I just reprint a big chunk of the review from the Scout Ship but I could copy and paste the review of the top to cover all the features of the bottom as well...!!! Back to the point - the front of the ship is much more angular than anything Romulan we've seen before with grates and fins protruding forward. 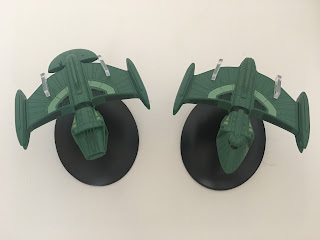 Eaglemoss have replicated the design perfectly and the dips between are well painted but not over painted as can happen with recesses on these models. It's a really odd piece that was added to the front of the ship with no visible command section or markings. The central piece is etched out with the more familiar Romulan feathered bird effect that represents the style of their craft more than the angular forward section. It is absolutely panel for panel the same mould as the one used for the Scout Ship (not a surprise since they ARE the same!) with the central piece also being the metallic element of this ship just as before. It's same again with the nacelles too. They are a great design and do include the lighter shade of green warp field grilles which are also translucent insets. The finish of the nacelles and the central block is spot on and identical to the original in every way. The only further significant difference is the semicircular/fan shape attached to the rear. Again it gives no sign of which way is really up on the Science Vessel since the only detail on its surface is mirrored on the flip side. 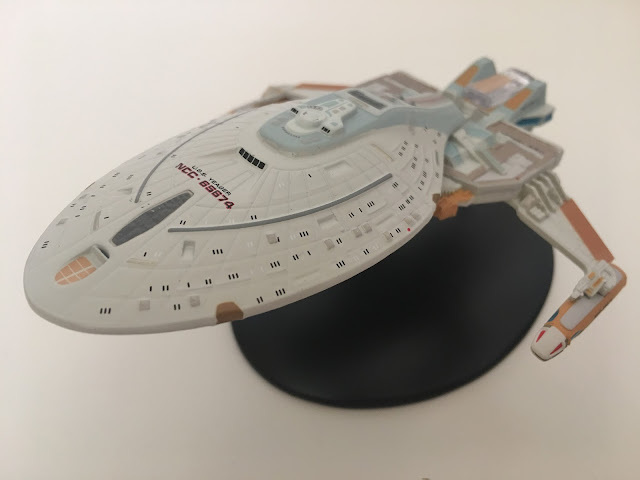 Admittedly the joining of all the sections here is exemplary and the conversion from the original model into this version has been completed perfectly by Eaglemoss. Tragically it’s one of the least inspiring of the series, even though it’s a Romulan design, mainly because of the updates. 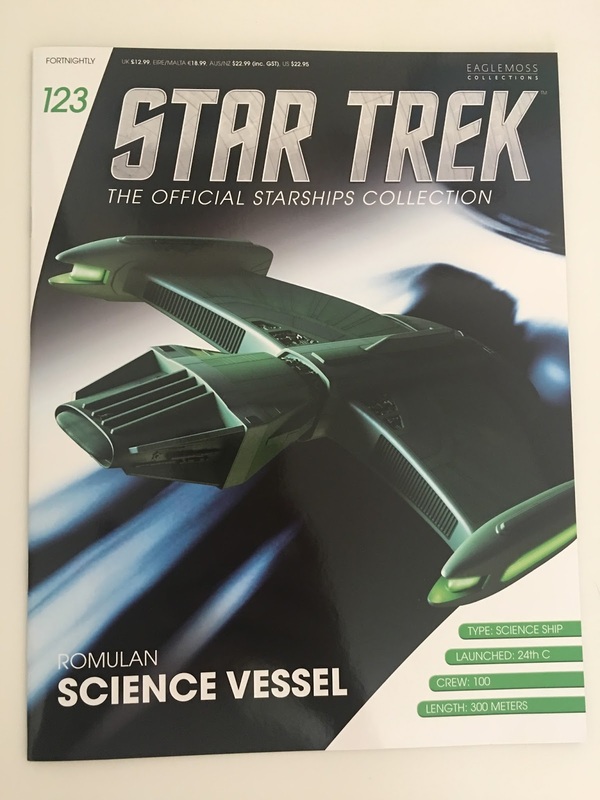 The magazine for the Science Vessel touches on the events of The Next Phase as well as including some minor stats on the craft. Much of the information relates to its singular appearance accompanied by shots from the episode and a few new CG shots. Greg Jein's workshop were responsible for the changes to the Romulan ship and the double page article on its creation. This also mentions some of Rick Sternbach's original concepts for the Scout Ship and how that influenced the alterations. There's also the shocker that the Science Vessel later turned up in Voyager flying the other way round in Favourite Son in a different colour...well I never! The third article in here is one of the more interesting and technical we've seen for many an issue with Rick Sternbach talking us through the history of the Romulan fleet from their split with the Vulcans right up to the latest iteration of the Warbird and the Reman Scimitar. 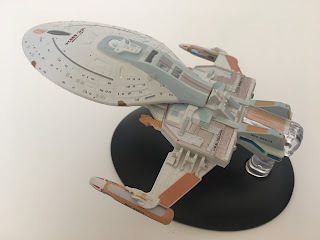 Sternbach's piece doesn't limit itself to ship types with diversions into warp technology as well as several pointers on Romulan upgrades and innovations through the centuries. It's not a subject that gets much attention and this is a great read all the way paired up with some wonderful tech images to help you understand the material. Issues 122 and 123 are something of a placeholder for Eaglemoss with a much better selection due over the next few months. May's first arrivals will be the SS Emmette from Enterprise's opening credits and secondly the Alice shuttle craft from Voyager. New builds and more than welcome after the huge slew of kitbashes we've been handling for the last four months. Is the Yeager a revelation? Is it better than we might have expected?